Ciao Raggazzi of UNH! Greetings from UNH’s Tuscany Campus Fall 2015 Cohort! My name is Takeisha Sinclair and I am currently a Junior double majoring in Legal Studies and English. It’s been a little over a month that I have been living and studying in Italy every day. I started traveling when I was a baby, but nothing compares to indulging in a completely different culture across the world for this long. This is an opportunity that I will strongly encourage other students to take advantage of for as long as I live. I’m not only having the time of my life, but it is a breathtaking experience just by doing it independently! I am over-joyed to have this opportunity, especially with the University of New Haven’s faculty who continuously treats us like family! A huge shout out to Jenny and Emily! We couldn’t thank you enough for the strong encouragement and support while we are here! With over forty of us, majority freshmen and a handful of juniors and seniors, we are beyond excited and fulfilled by living and studying in Italy for three and a half months. We flew into Milan and visited Florence many times for class trips. We’ve climbed to the top of the famous Firenze Duomo and experienced the breath taking view of Italy. We have learned so many details about the famous Santa Maria Novella church, which is an important church around the world! From climbing Rio Buti to swimming in the coldest water, Italy is treating us so well with its beauty and welcoming culture. “Being away from home, especially in Italy, has opened up my eyes to a beautiful culture and countless opportunities to explore and travel,” said Feyjon Cobos, a freshman majoring in Chemistry at UNH. 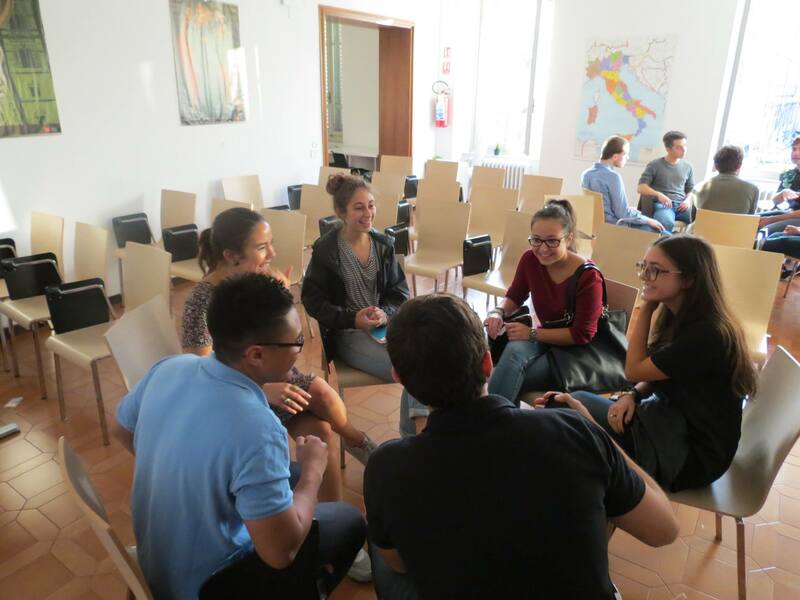 We are the first fall semester cohort to have the luck of participated in Prato Week which previously took place in the Spring semester and consisted of the UNH, PIN University in Prato, and Monash University of Australia. We were featured with an outstanding marching band that led us around the streets of Prato and instantly grabbed the attention of the Pratians as they danced and cheered UNH on with us. One exciting event that we couldn’t have imagined representing UNH any better was when Charlie the Charger who made his way to Prato all the way from New Haven, Connecticut. Prato loved him! “My experience in Europe so far has expanded my curiosity for the unknown and widened my desire and love for traveling,” said Arianna Colletto, a freshman who is majoring in Journalism. This is what most students believe is one of the best parts of studying abroad: traveling to other European countries. We are making sure to explore our way through Italy. This is the only regret most students who go abroad have. Some of the students have participated in Oktoberfest in Germany, rode the Gondola in Venice, enjoyed the beauty of Italian beaches in Italy’s well-known Cinque Terre, the five terraces of Italy, and of course, a few students have made their way to Rome. Traveling upon traveling and even more traveling as we approach our Fall Break with a full week to explore Europe! More pictures and exciting news about the countries we will have visited are coming soon! 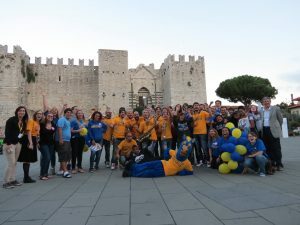 Not to mention how our students are making their mark around Italy individually and as a group! A handful of students are interning at various places for their Advanced Italian class, while leading one of our classes, Viva La’ Talia, our chemistry students using the chemistry lab that we officially received partnership with an Italian high school, and even Italian Conversation Exchange. This has been such a great way to enforce the Italian that we are learning and make friendships that will last a lifetime! It is beyond great to know that we came all the way from New Haven’s campus to make a difference in Prato. More news is on its way from us as we make our way through Europe during Fall Break with exciting pictures showing our excitement in each city we step foot in! Ciao Riggazzi!